We need to have a new, broader view, at the centre of which we do not find the Institute of the Sisters of charity but the spirituality of Saints B. Capitanio and V. Gerosa, as a source of Spiritual Fraternity. It is made up of all those, who in spite of living different forms and states of life, recognize in this particular spirituality a strong and significant help to live authentically as men/women who belong to Christ, and to be at the service of the Kingdom of God. The one and the same Gift of the Spirit moulds each one’s identity according to a common characteristic feature that is expressed in different ways in various forms of life. This Spiritual Fraternity in which, alongside our Institute there are several other lay associations and individual persons living the charism in a secular state of life, is already a reality to be recognized even though it needs to be consolidated and better clarified. – the mission of charity which each one is called to carry out in his/her own state of life. The commitment and the style of Spiritual Fraternity of Saints B. Capitanio and V. Gerosa are traced out in the following Charter. 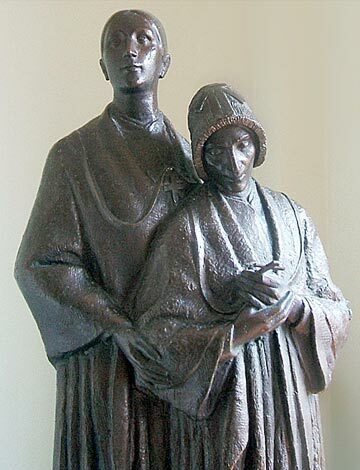 “Spiritual Fraternity” comprises various expressions and forms of life in line with the Charism of Saints Bartolomea Capitanio and Vincenza Gerosa. The core of the Charism is the Charity of Jesus the Redeemer, who does everything possible, suffers everything and even sheds His blood that others may have life and be partakers of His same Love. Every member of the Spiritual Fraternity – in whatever state of life she/he may be – is aware that his/her primary task is to recognize with grateful wonder the gratuitous and merciful Love with which Jesus has loved us and loves us at all times. The members desire to abide in Jesus’ love by cultivating a living personal relationship with Him: meditating the word of God, taking part in the liturgical celebrations and in accepting their brothers and sisters. From this profound union and reliance on Him, every member of the Spiritual Fraternity will continually draw and maintain cheerfulness of heart and the courage to take up initiatives for the benefit of their neighbour. In this union, members intuit, by the promptings of the Spirit, that their own person is a gift received, to be spent for the benefit of their neighbour, starting from those the Lord places closest to them and those who are in greatest need both spiritual and physical. From this union with Jesus – cultivated and kept up all through the day – there spring up attitudes and deeds marked by His love, lived as a partaking of his meek and humble heart, that in all things seeks what pleases the Father, for the real good of humankind. Especially dear to the members of the Fraternity as a means to abide in the Charity of Jesus is the friendship-in-faith with all those who walk along the same spiritual journey. It is a gift of the loving kindness of God, cultivated by communion in prayer, sharing of faith nourished by the word of God and concrete fraternal assistance. Such friendship is a place where we experience Jesus’ charity, after the example of Bartolomea, who had lived it in her “Pious Unions”. The Spiritual Fraternity of Saints B. Capitanio and V. Gerosa, in whichever place it may live or in whatever form of life it may express itself, desires to be a modest instrument in the hands of God to reveal the tender loving care of the Father to every person. In particular, it attends to children, the young, young couples, the sick, the aged, the marginalized and those who have no access to a fully human life. These “least of his brethren” are the “beloved members” of Christ, in whom he takes delight to be hidden and in whom he wants to be loved and served. – at night, after the day’s work – when each one of us stands anew before the gaze of the Father and, praises Him for what He has accomplished on that day, also through our own poverty. To Him we hand over the seeds of good we have sown; to Him we entrust our own cry for help and that of countless brethren we have encountered. – at Sunday Mass – celebrated in various ecclesial communities – which is the key moment of spiritual encounter for every member of the Spiritual Fraternity. In the Eucharistic sacrifice, together with bread and wine on the altar, all of us offer ourselves to the Lord. In this way, our life is ever more immersed in the Gift that Jesus makes of himself for the salvation of the world and is drawn into Jesus’ act of self-oblation. Jesus the Crucified and Risen Lord continues to form his Church with the grace of his Word. He is the absolute source of reference of the Spiritual Fraternity. He is our Stronghold: the One to whom we entrust the care of ourselves being sure of His providence; he is our Norm, from whom we draw inspiration to be men and women truly humane; he is our Guide, whom we follow by letting him trace the path for us, in the Church. Thus each member gradually arrives at living – in keeping with the form of life chosen – a life that is chaste, poor and obedient, which enables them to accept and make known His Charity. To follow this journey of holiness, the members train themselves to a profound listening to the word of God, in particular the Gospel, through their commitment to ‘meditation’, some daily, others at least once a week. Wherever possible, we shall have regular meetings of Lectio Divina (Sharing of the Word of God) inviting also the others. Every month – where possible, according to one’s form of life – every member sets aside a longer time for ‘solitude'(recollection day) and during the year, a time for ‘spiritual retreat’. These moments of prayer enable us to interiorize in a deeper way the word of God, to review in all truth our own life, to contemplate His face for a good while , to be more attentive to His promptings. The members of the Spiritual Fraternity desire to be moulded by the particular grace of the Charism, that has in the words of B. Capitanio a precious, wise expression. Therefore, every member cherishes in her/his heart attitudes that Bartolomea and Vincenza considered important and keeps in mind key expressions of their spiritual experience, that will mark and form their personal as well as the common journey-of-holiness, to which the Lord calls each one of us.